The 1970s and ’80s hit the neighborhood hard, Bragg said. Efforts by neighborhood gardeners are helping, too. When residents see a beautiful front garden down the street, they want to know how they can do that in their yard, too, Bragg said. I visited the garden walk last year and saw some cool gardens with talented gardeners who are ready to tell you their stories and share tips. See the garden of co-organizer Ruth Cooper here. 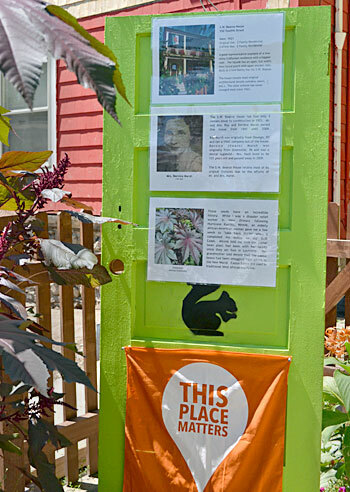 You can see for yourself during the Black Squirrel Garden Walk to be held from 10 a.m. to 4 p.m. Saturday, July 15. Pick up maps at 458 Memorial Parkway and at the Schoellkopf Park shuttle stop at Portage and Pine. Shuttles will be available as part of the Garden Walk of Niagara Falls, USA event, which is happening at the same time. Garden Walk Niagara Falls promotes the beautiful gardens in historic areas and at community and municipal institutions in the downtown areas. That event includes speakers and other activities. See more details here. See all of the garden walks and other gardening activities scheduled for this weekend on our Events page. The Black Squirrel Garden Walk, which is named that for the black squirrels that you can see in Niagara Falls but aren’t common elsewhere in other parts of Western New York, aims to promote the neighborhoods in the downtown area of Niagara Falls, showcasing the gardens and architecture. Last year Bragg, one of the organizers of the garden walk, was happy to share the story of his garden, which he had started in mid-summer only the year before. The large purple plants in the front are castor plants. Bragg grew the plants from beans given to him by Minnie, an elderly woman he met when he was a disaster relief worker in New Orleans following Hurricane Katrina. Minnie’s grandmother told her that the castor bean plant had been with Minnie’s family since they set foot in Louisiana. The beans, used in traditional West African medicine, had been smuggled in from Africa. “The plants mean a lot to me,” Bragg said. He tries to be organic and credits much of the success of his plants to the work he did building up the soil. Bragg is interested not only in the gardens, but in the history of his neighborhood. 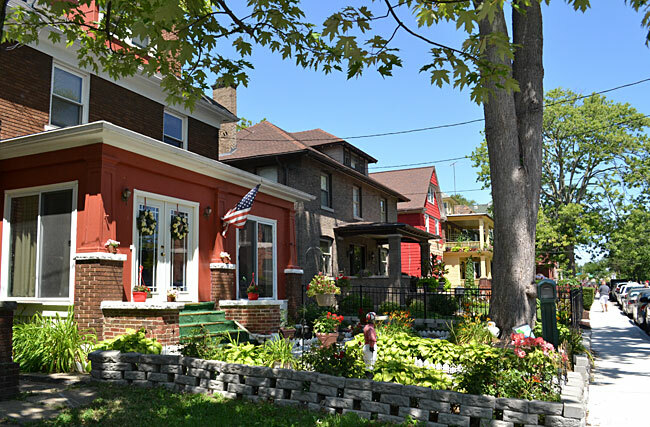 He is a planner and historic preservation specialist for the City of Niagara Falls and encourages his neighbors to find out more about their homes. There was a building boom in the 1920s and the Memorial Park neighborhood, which is now downtown, would have been considered the suburbs of Niagara Falls. The apartment Bragg is renting is in a house that was built as a two-family home. Called the S. W. Bearce House, it has had only three owners since its construction in 1921. Ray and Bernice Marsh, the second owners, had the house from 1941 until 2009. Ray ran a heating, ventilation and air conditioning company out of the house. Bernice, a dental hygenist, lived to be 101. She died in 2009. 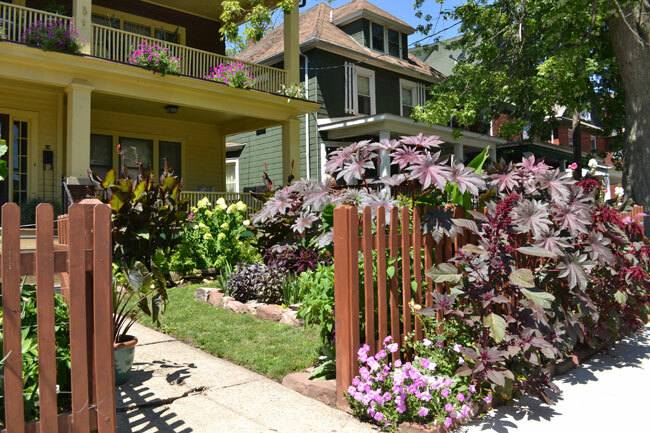 Gardening is one way to keep neighborhoods strong, and Bragg and co-organizer Ruth Cooper are trying to get more and more people involved. Last year Bragg and Cooper bought $300 worth of canna bulbs and shared them with neighbors. Cannas get tall and add drama to a yard. They can be planted in the ground or in pots. An older person who can’t dig and bend like they used to can tend a pot filled with a canna and some colorful coleus. This year neighbors can “borrow” some of the bulbs, promising to dig them up in September (the bulbs can’t take our winters) and return them to the organizers so they can be shared again next season. They have also held perennial exchanges during the year. Not only do folks get to try new plants, they’re rubbing shoulders and exchanging ideas. Gardens are getting nicer and properties are kept up more. Be among the first to experience intimate dining at Botanical GardensChanged your email? I miss you! Tell me your new address! I lived in Northern Ontario and Southern Ontario as a young girl and only saw black squirels. It was not until we moved to Williamsville 48 years ago that I saw my first gray squirel. That is all we have here. So interesting since we are so close to Niagara Falls. Carol, I was thinking the same thing. I live in the Eggertsville area of Amherst and we don’t have any black squirrels. You’d think they would have made it here by now. After living in my Tn. of Tonawanda neighborhood for over fifteen years, I saw a black squirrel on the corner of Decatur and Parkhurst (home to a 7-11) for the first time this summer! Wow! Maybe they’re heading my way!